Lateral overload pain, which may or may not include cuboid syndrome, and peroneal tendinitis is very common. I see this in my practice with new cases several times each month. Typically this involves a patient who presents with pain affecting the outside of the foot. This could be behind the fifth toe extending up midfoot even including the outside ankle bone. This part of the foot is called the lateral column. Sometimes this is isolated to just the fifth metatarsal area. History: This may or may not a chronic problem. But often this could be related to an increase in activity or even a pair of shoes. Typically the activity and/or shoes will cause a change in the weight bearing pattern of the foot and cause the onset of symptoms. A shoe that has a lot of wear on the outside may make one prone to these problems. Starting a walking or running program, increased activity and weight bearing pressure can also make one prone to this. Oftentimes there won't be any swelling on the foot or any history of a one-time specific injury. Clinical findings: I typically will see this when a patient's tendon have a higher arch foot structure and already bear a lot of weight on the outside of their foot. Usually the patient is aware that they tend to bear weight on the outside of the foot and they may have a lateral or outside wear pattern on their shoes. But also some individuals will have knees where the leg bone curves inward a bit more than usual. This is called genu varum and is also sometimes called bowlegged. Down at the ankle and where the leg meets the ground we call this tibial varum and this also means that compared to perpendicular the leg is curved inward toward the center midline of the body. Therefore this can be caused by structural problems in the knee leg/tibia or ankle. But also it can because by people that have a high arch foot and therefore within the foot itself. In addition, some shoes, with more arch support and people that have a high arch need. So some shoes will throw the foot even further out so that they are walking on the outside of the foot more than they should. For example, I really like the over-the-counter Superfeet inserts but for some individuals these will make the symptoms worse. Special tests: Special tests such as x-rays often reveal the high arch foot structure but do not show any other problem. Because there usually is not a stress fracture involving the fifth metatarsal. The fifth metatarsal is not locked and the foot like the second third and fourth metatarsals are and therefore the second third and fourth metatarsals are more rigid and more prone to a stress fracture. The first and fifth metatarsals have a more flexible range of motion and rarely does once a stress fracture involving these bones. 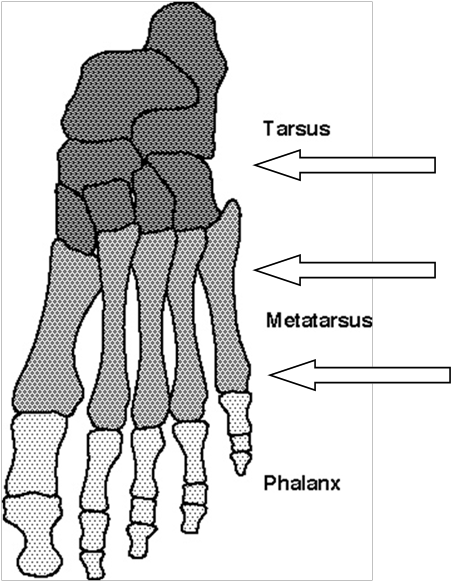 But one does see on the fifth metatarsal because it is not as large and is not designed to bear the weight in other parts the foot such as the first metatarsal are, the fifth metatarsal does not respond well to the increased stress and instead of getting a stress fracture develops this lateral overload pain. Treatment: This involves changing any shoes that might be contributing to excessive lateral weight bearing position of the foot. Also, any inserts that have excessive arch support or have a lack of lateral arch support should be changed. For example, when orthotics are used we have to specifically build up the lateral column of the foot. This doesn't mean there is an arch support it just means it's not as essentially as it typically might be. Additionally, the lateral column of the foot is built up to help keep the foot from rolling out excessively. This also tends to help individuals who have weak ankles and tend to roll them to the outside a lot. Many of the same principles tend to help treat peroneal tendinitis. Peroneal tendinitis is by far more common in individuals with a very high arch foot that have this lateral weight bearing pattern of gait. If you are experiencing this type of pain in your feet visit our website for more information at BestFootDoc.com.